A man dubbed the "poster boy" for Romanian migration to the UK died in a car crash after taking cocaine and driving in excess of 100mph while disqualified, an inquest has heard. Victor Spirescu was the first Romanian to arrive in the UK to work when EU regulations changed in 2014 and was met by a media scrum at Luton Airport. 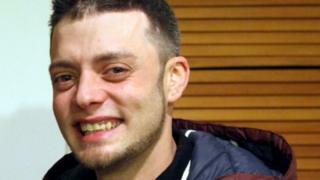 Milton Keynes Coroner's Court heard the 33-year-old was not wearing a seatbelt when he died on 15 January. He died of multiple fractures. The court heard Mr Spirescu, who was living in Milton Keynes, was driving a black Mitsubishi Galant with his friend, Eugen Condurache, in the passenger seat. In a witness statement, Mr Condurache said they were driving to the shops to buy cigarettes when Mr Spirescu said he would show him a "proper doughnut" - a manoeuvre where a car is spun 360 degrees, leaving a ring of tyre marks. He said Mr Spirescu was not wearing a seatbelt and was travelling between 100-110 mph when the car began to roll on Chicheley Hill, Newport Pagnell, at about 04:00 GMT. "He was screaming in a panic. He knew something was going to happen," Mr Condurache said. The car then crashed into bushes and Mr Spirescu was thrown out of the vehicle. A passer-by stopped and called emergency services, but Mr Spirescu died at the scene. Romania joined the EU alongside Bulgaria in 2007, but controls were imposed by some member states on people from these countries. In Britain, prospective employers had to apply for work permits and Bulgarian and Romanian migrants for an "accession worker card". Low-skilled workers were restricted to existing quota schemes in the agricultural and food processing sectors. On 1 January 2014, these restrictions were lifted and Romanians and Bulgarians were free to work in the UK. There was a media frenzy prompted by claims Britain would be inundated with migrants but on the day journalists found only one man entering the country from Romania - Victor Spirescu. He was greeted by the Labour MP and then Chair of the Home Affairs Select Committee Keith Vaz. "I don't come to rob your country. I come to work and then go home," Mr Spirescu said. "Here you pay a lot; in Romania it's very cheap." His face was pictured in various newspapers the following day who branded him the "poster boy" for Romanian immigration. Andy Evans, forensic collision investigator for Thames Valley Police, said the car's MOT had expired and Mr Spirescu was disqualified from driving at the time. Pathologist Dr Jenish Patel said Mr Spirescu's cause of death was multiple fractures, with his intake of cocaine and alcohol contributing factors. Senior coroner for Milton Keynes Tom Osborne said it was "fortunate no other vehicles were involved" in the crash. Mr Osborne concluded Mr Spirescu died as a result of a road traffic collision.